near southeast corner of Montgomery and Clay Street's San Francisco. Note the large skylight left of center. Wm. H. Keith & Co. Drugs & Medicines, on Clay Street. In 1852 another Daguerreian artist by the name of Peter G. Clark was listed at this address. In later years it was home the Daily Morning Call that burned in 1859. 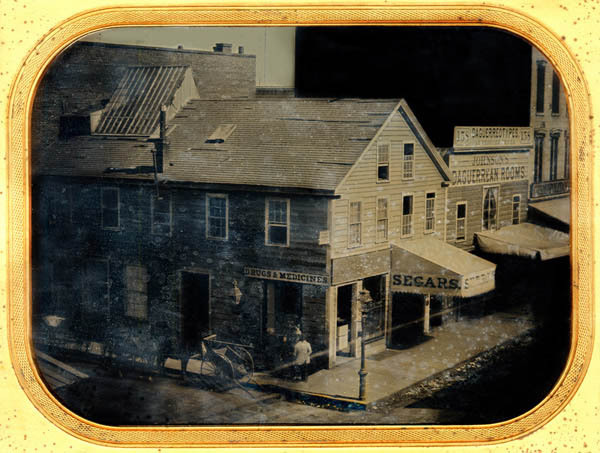 Daguerreotypes on silvered Copper plates were produced between 1839 and the 1860's. We also have photos of the Cliff House, Sutro Baths. San Francisco 20Th Century photo gallery. San Francisco-Oakland Bay Bridge and Golden Gate Bridge photos.